Relying solely on free online tax services or inexpensive accounting tools is a small risk that many people don’t realize until it’s too late. If you’re a small business owner, the best thing you can do for yourself and your business is to invest in the services of a licensed accountant. Trust us, it’ll be worth every penny. Hiring an accountant in the Brooklyn area like Joseph Falco’s Accounting Services will open doors and resolve any troublesome financial burdens your business has been struggling with, as well as introduce new tax saving opportunities. In a previous blog, we discussed why you should hire a tax professional. In today’s article, we have prepared ten of the most important things you should ask your accountant or tax professional to protect your financial interests. When you invest in the services of a professional accountant, it’s important to know as much as you can about them and their services to ensure they will do what is best for your business. As you are browsing for the best accountant in Brooklyn, be sure to give Joseph Falco a call for a free consultation, and keep this list of questions handy, as he’ll know just how to answer them. How do I reach you, and how often can I contact you? As a client, you have the right to contact our office as much as you’d like. We understand the need for reassurance and when situations arise, you’ll want to contact your accountant at a moment’s notice. It’s best to establish an understanding of communication, whether it’s in person, via email, over the phone, or any other means. Discuss the frequency that is best for your needs as well—you’re sure to have a healthy and beneficial relationship with your accountant. How do I prepare for tax season? Which tax credits and deductions should you claim? Are there any new laws you could take advantage of to maximize any write-offs?Get your tax questions in order and make sure they are answered well before the April 15th deadline. Avoid the end-of-the-year rush and gather all of your documents and contact an accountant today. What should we discuss on a regular basis? A professional and skilled accountant, like Joseph Falco, will get to know your business well enough to keep you in the loop of anything that needs to be brought up. Joseph Falco Accounting Services are extremely well-versed in all aspects of business and personal accounting. Our offices can assist you in determining certain business decisions to keep you and your company’s best interest in mind. Your accountant will help you weigh the pro’s and con’s of your decisions, and understand your actions without the confusing accounting jargon. As a business owner, you’ll find that one of most important business relationships you’ll have with your accountant due to the regular consulting and private matters you’ll be discussing. Joseph Falco takes pride in professionalism and knows the importance of confidentiality and will take the time it takes to build your trust. How can you help build my business? For small businesses, one of the main goals is to grow your business—any way you can. Your accountant should be able to help you accomplish your goals and expand your growth. Joseph Falco Accounting Services can help you pick a financial model for you to follow from the ground up, and adjust throughout with actual results so you know what the next plan of action is. Can you assess the value of my business? Joseph Falco’s accounting strategies will help to build an understanding of the industry your business is in order to operate at its fullest potential. By working with a professional business accountant, it’s typical to sit down and evaluate any of the comparable companies and what drives their value, then work together to direct your company toward maximizing those aspects. Hiring Joseph Falco to manage your accounting services is one of the best decisions you will make in terms of running a small business. But if you are not completely honest and open about your business and financial planning, it will be a real challenge to provide the best accounting services we can. Don’t make that mistake, and don’t be afraid to open up with your accountant. 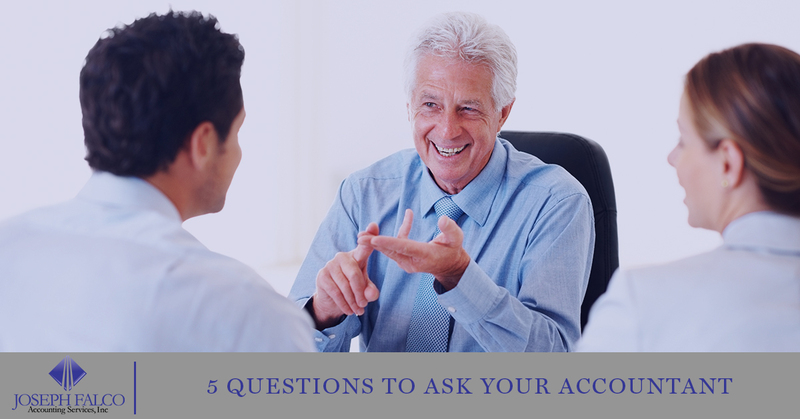 By asking these simple questions at your consultation you will set the tone of the remainder of the accounting relationship. Be sure to contact us and set up your free consultation with Joseph Falco today!